This is a great spot to spend time with the family and visit others. It is definitely crowded and has lots of little ones running around, so I wouldn't suggest it for a quiet get away. But the pool is nice and there are lots of things going on to entertain the kids. The staff is nice and if you forget something you need not worry- there is a store at the campground. 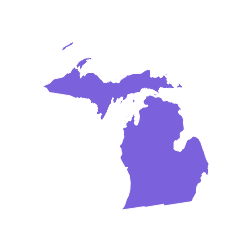 It is also located near Saint Joseph, MI where there are plenty of things to do. There are many wineries and u-pick fruit farms nearby. Nice pool, hot tub, movie for kids, train ride for kids. Small sites, lots of people. Camp hosts were fantastic as were camp store employees. Nice store and pizza shop. Just too crowded for our tastes. The campground itself is lovely and the couples that live there during the open season are extraordinarily kind. I would note,however, that the cabins are on the far back of the property and there is a depression in the gravel road before getting to them. Because it rained rather heavily, it makes it formed a huge collection of water. The bathrooms are semi clean, but expect mud basically everywhere. It’s very close to the shoreline though and we will probably go again :) Bring rain boots for mud! First impression on entering the KOA was that it was very clean, organized and well maintained. The owners and staff do a great job of keeping the campground safe, clean and inviting. Sites are well maintained, clean and spacious. The store has everything you could need and if they don't, there is a gas station right outside of entrance. Close to the lake, will visit again!